April 25th, 2010. I completed my first marathon in Four hours, Eleven minutes, and Sixteen seconds. The 10th running of the Oklahoma City Memorial Marathon – A Run to Remember was a great marathon to choose to be my first. Over 23,000 participants lined the street in front of the Oklahoma City National Memorial at 6:30am to kick off what proved to be an exciting/excruciating 4+ hours. Many people ask what goes through your mind when running a marathon and honestly not a whole lot goes through your mind. For a solid 3 1/2 hours, it’s “left foot, right foot, left foot, right foot,” but there were a few distinct moments that I remember where I was and what I was thinking throughout the 26.2 miles. Mile 0.0 – “Amazing at how many people there are and how many people are cheering runners on at 6:30 on a Sunday morning.” There was a huge smile on my face as I crossed the start line in front of the Memorial. Mile 22.8 – “There’s that pace group I should have stuck with from the beginning…..” as it passed me. Mile 24 – Some guy runs by me and says, “Come on now” and that’s all it took, I kept pace with him until the end. Thanks stranger that ran past me, you saved my race! That was my first marathon racing experience. It was grueling from mile 21-24 but after crossing the finish line at 26.2 miles, I felt so accomplished and even though I didn’t meet my goal time at 4 hours, I was ecstatic to have finished a full marathon. 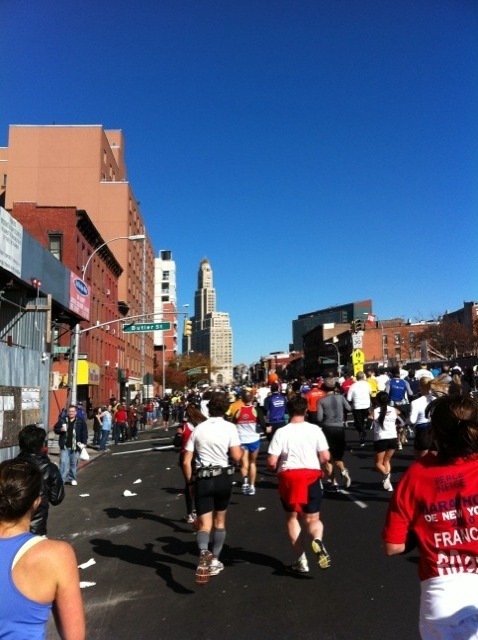 I have been drawn into the NYC Marathon on November 7th, 2010 so I plan to keep running. I love how I got somewhat addicted to running and that I actually made time to train. It’s a great feeling to have finished a full marathon for the first time in my life! Run on!